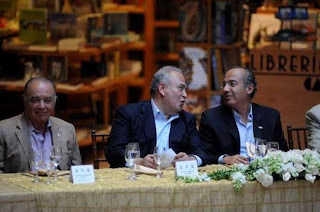 BAJA NEWS: Since 2007: NEWS - Why did President Calderón pay a visit to Tijuana? 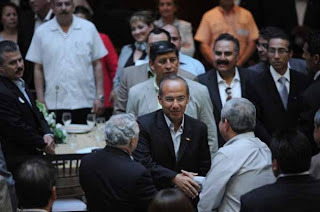 TIJUANA – Business leaders, politicians and even TV news anchors who turned out to hear President Calderón on Tuesday believed he had come to deliver a gift: The announcement that Baja California would get a special designation to fuel its economy. Instead, the 200 who packed a hall at the Centro Cultural Tijuana heard a 37-minute stock speech in which the president said Mexico had a promising financial future despite the global financial crisis. “Mexico is considered an economic success abroad,” the president said. Before arriving in Tijuana, the president inaugurated a series of public works in Mexicali, such as the expansion of the aqueduct to the Colorado River, a hospital and a new highway to San Felipe. Meanwhile, outside the center about 100 members of a group called Antorcha Campesina (Farmworkers’ Torch) protested a shortage of land for housing and demanded the liberation of political prisoners. A dozen opponents to the massive Tijuana project called Zócalo 11 de Julio also demonstrated, all before a squad of federal police that had formed a barrier to contain the protesters. The president’s brief visit caused traffic chaos in the Río zone, the city’s financial and tourist center, as police partially closed the main thoroughfares of avenida Independencia and Paseo de los Héroes. The president arrived at 4:20 p.m., accompanied by Baja California Gov. José Guadalupe Osuna. Some 200 business, community and sports leaders, as well as politicians, academics and news media editors and owners were waiting for him, sitting at fancy tables where they feasted on a dinner prepared by renowned chef Miguel Ángel Guerrero. The president spoke with guests in private then delivered his speech. Before Calderón took the podium, the governor seemed to be setting the table for the president’s announcement that Baja California would be named a Strategic Economic Zone. The governor mentioned the four greatest obstacles the state had faced – the surge of drug violence, the H1N1 flu, the world economic crisis and the earthquake in Mexicali – and how his administration had responded to promote the state as an economic center. Then he said that “there are interests in the national textile industry” that are fighting Baja California’s designation as a Strategic Economic Zone. The federal government designates these regions to receive a host of legal, commercial and tax incentives to stimulate economic development, technological innovation, help make their products and services more competitive in the global marketplace and enhance infrastructure. Experts from the respected College of the Northern Border have said the designation would help Baja California stimulate its economic “clusters,” attract investment and generate better-paid jobs based on innovation. But all that will have to wait for another day. Despite giving a speech focused on the economy – he only referred once to the violence in the country, saying “Mexico is more than news stories about organized crime,” Calderón never addressed the subject of the Strategic Economic Zone. At the end of his remarks, the president received polite applause from audience members, who turned to one another with expressions of disappointment and disbelief.